Engineering excellence in the form of one system with many applications, UltraMAX is the most versatile and adaptable production system ever. Completely configurable to meet your output requirements, able to deliver the lowest emissions and designed for long life & easy maintenance. The Magnum Venus Products High Volume unit features the UltraMAX pumping system, a modular design, no castings or machined parts and air motor options suited to multiple applications. 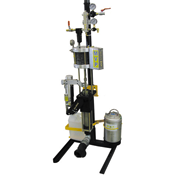 This system is designed for FIT, spray, RTM and pour applications. The UltraMAX High Volume/Filled Chop System features the new DuraMAX gun. This rugged gun features a carbide needle and seat (standard), and is the only gun on the market with built-in shut-off valves for resin and catalyst. Now you can perform routine maintenance without the need to drain pressure or remove hoses.